So I wanted to revisit my Five Minute Friday post about the vulnerability of letting people get close to us. I've always thought of painful memories as being buried. I kept trying to pile more and more soil on top of what I didn't want to think about. Sometimes I even planted flowers in that soil, trying to hide the ugliness underneath. But flowers eventually die, and winter frost brings soil heaving. The surface cracks and what's under the top layer starts to be revealed. It's not easy following Jesus into the whitespaces of the soul. I have wallpapered over many things, believing faith enabled me to move past them. But there comes a time when it takes more faith to fall apart with Jesus than to stay strong enough to stop it from happening. The time came for me to go beyond wallpapered memories, because Jesus walks the desolate places. And this is where my journey to find God and soul rest began. Whichever illustration we apply, it's about trying to cover over the memories we don't want to think about. Maybe those memories stem from our own foolish choices; I have plenty of those. Maybe they were caused by other people: I've been betrayed, threatened, stalked, assaulted, blindsided ... all by people I'd trusted not to hurt me. Or maybe they're things that just happened, like the death of someone close. The pretty appearances we've created don't last forever. Those memories are still working on us even though we try to ignore them. For me it took major depression to make me realize that I couldn't hold it together on my own. It took counseling to start uncovering those memories and sorting them out. To do that I needed a safe place. Someone I could trust to listen and not to judge. Someone who would still stand beside me after I'd revealed the mess inside. A Jesus who would catch me when I fell, who would comfort me in the ensuing ache. Faith that He would be there in the turmoil. The process hasn't been an easy one. Some days we uncovered too much, and it was like scraping against raw skin. But bringing the memories into the light and dealing with them has allowed me to set them aside with peace. To find closure, as they say. If you recall, PEACE is my One Word for this year. Uncovering this old junk, finding increasingly deeper hope in Jesus, and moving forward--even when the road is uphill--are all parts of seeking that peace. What an amazing description of what I do, too! Even this planting flowers to hide the ugliness even more. Just act strong, paste a smile on my face and say, "I'm fine!" The excerpt about it taking more faith to fall apart with Jesus than to stay strong enough to stop it from happening really struck me, too. I am blessed to be on this journey with you, Melissa! Glad to be linking up beside you today Melissa! Your journey sounds familiar Melissa.........I blocked out nearly all of the first nine years of my life, so some of what I feel is a mystery as to why...bot HS has been helping me remember, walk through, and release.....it is so freeing isn't it! Glad to be on this journey with so many women of God! 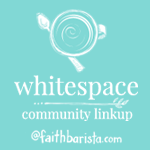 Visiting from the Spiritual Whitespace linkup ... I really like your illustration: "I kept trying to pile more and more soil on top of what I didn't want to think about. Sometimes I even planted flowers in that soil, trying to hide the ugliness underneath." Such a good description of how we try to cover up the very things that we need to face, and let God into - for healing. Thanks!